When you receive this wonderful pendant of Our Lady of Guadalupe, you will be receiving more than just a piece of jewelry. 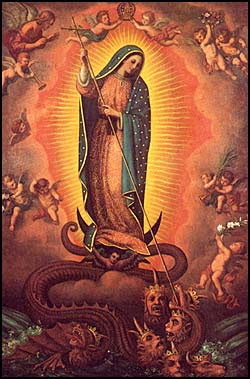 We have spell cast and imbued with the energies of Our Lady of Guadalupe to help you connect with her fast when you need to call upon her. Let Our Lady of Guadalupe be your “Miracle Worker.” Ask her to help you make the right decisions, heal yourself or someone close to you, especially of addictions, help you with your financial struggles, or anything else you would like her help with. You are not alone. There are thousands of people all around the world that are constantly calling upon her for her support. HOWEVER, by using this spell cast and energetically imbued pendant, you will be able to summon her to help you MUCH FASTER than others are capable of doing. She is a listener. So PLEASE, talk away! This is not a spirit bound pendant. She is energetically imbued and the pendant itself has been cast on for special access to calling her quicker. When you are in need of her, all you must do is ask. Below, you will find the prayer to recite to get her attention and ask for her help. Say this prayer at least once a week to lengthen and strengthen this spells effectiveness and insure her quick response to you when you need during the day. Once you have read the prayer in the presence of this statue, you will no longer need to keep the statue with you when you are calling her. You only must keep it displayed somewhere in your personal space.